Risi e bisi is a pea risotto from the Venetian region of Italy. The dish is traditionally prepared on April 25th, the feast day of Venice's patron saint, St. Mark. In a large pan on medium heat, melt 3 tbsp margarine and add the diced onion. Sauté for around 10 minutes or until the onions are translucent. Add the salt, pepper, spices, and peas and sauté for another 5 minutes. Pour the wine into the pan and stir for around 3 minutes. Add the dry rice and stir until it has soaked up all of the liquid. Add the broth, cup by cup, while continuously stirring for 20-25 minutes or until the rice is cooked. Add 1 tbsp of margarine after removing the risotto from heat and serve immediately. In our country, we associate this as fried rice, but we dont put white wine in it. You can order croquetas at pretty much every bar in Spain, though they are usually made of ham and cheese or fish. A vegetable variety is rare, but the most common types include mushroom, spinach, and eggplant/aubergine. This recipe is for spinach croquetas, but you can replace the spinach with whichever vegetable you fancy! Note: this recipe requires around 2 1/2 hours of refrigeration. This eggplant/aubergine based dish has different varieties throughout Italy, most popular in the regions of Sicily, Naples, and Genoa. 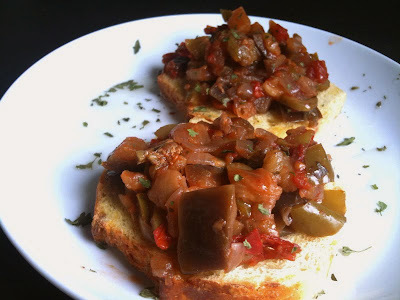 This recipe is for the vegan-friendly Sicilian Caponata. It can be served as an appetizer on top of bread, on pasta, or as a main dish. In a large pan, heat the olive oil. Add everything to the pot and simmer on medium heat for about an hour. Serve! This vegan casserole dish comes from the island of Mallorca, Spain. It is served in almost every restaurant, so if you are ever in the area you have a vegan staple available to you. The recipe calls for a lot of frying, so get make sure you have a lot of oil available before you begin to chop. I'm a vegan of six years living in Barcelona, Spain (originally from San Antonio,TX). I started this blog because I am inspired by the simple, delicious food of the Mediterranean. Thanks to Clarisse Rodriguez for the use of her camera!